While authors fly with symbols and metaphors, Saul Stokes makes his ascension with sound - shining most when the artistic and the technological intersect. His epic Objects and Phenomena (95'19") is the kind of album that reminds us why we like EM, how it can push boundaries and break open tradition. 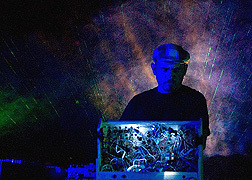 Stokes has a genius for locating truths buried in raw aural abstractions - and shaping them into infectious, free-spirited, fanciful compositions. 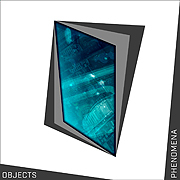 The nine tracks on Objects and Phenomena provide a peculiar pull. Vividly electric, this work is hugely pleasurable to consume. Mind music, which settles in your body - its percolating drum machines, glitteringly clean synths, tumbling rhythms and shuffling tension all combine perfectly with the verve and color of effortless playing and production. A progressive sensitivity at work, Stokes reveals anew his independent spirit and artistic daring. Nervy sparkly sonics sing in rhythmic cohesion and gentle musical experimentation. Buzzing tones lean against lush, rushing chords, winding their way from the wall outlet to the listening space - all above the ticking, tickling pulsation of bass notes and e-percussion. As the surging current recedes into quieting calm, a humming consonance momentarily holds us - a gentle rest before a surging sequencer emerges to lead our thoughts into echoing mental realms. Engaging and assured Objects and Phenomena demonstrates an inexhaustible originality and precision. His journey of invention has added provocative new dimensions, as Stokes seeks to discover how close music may bring us to the truth and feel and force of life. Realizing good Electronic Music requires dealing with some of the most intricate and convoluted processes in all of art. For Stokes, it takes the cool dark and sweet detention of his music studio to learn anything. Taking two years to sweat out Objects and Phenomena, he appears to have successfully dissolved the lines between primitive sonic innovation and cultivated contemporary tastes. What is out there beyond the world of rules? And can we survive it? Saul Stokes knows, and believes we can too.